To fix South Africa's SOEs is a difficult and politically dangerous move. 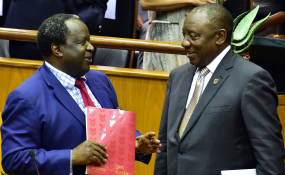 Tito Mboweni's Budget speech shows that there are strong elements in the ANC and government who want to make very real changes to the way that state-owned entities are run. That will not be easy, though. Or soon. In some ways, Tito Mboweni talked tough, through what he said, through what has been announced in the Budget, and through what has not been said. There are those who oppose change, who clearly benefit from the current situation that got them into their position in the first place. The real test for Team Ramaphosa will be in effecting a meaningful and long-lasting change in the way that these entities are treated, and run. For his part, Mboweni has never one to run away from a right. In the past, there have been moments when it looked like he almost relished a good scrap.